Bennett’s last appearance on Arrow was a glorified cameo in the season three episode “The Return,” and though he was still a mustache-twirling badass with the ability to effortlessly get under the skin of Amell’s Oliver Queen, he was unfortunately used as more of a plot device than as the actual fleshed-out character he became over the course of his original appearances. 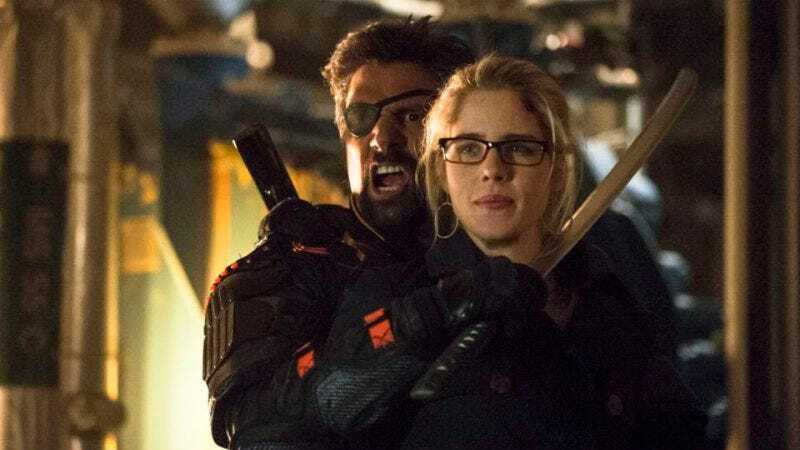 After the episode, rumors suggested that Bennett was unhappy with how his character was treated and that he wouldn’t return to the show again—rumors that were supported by the fact that Bennett wasn’t brought in to wear the Deathstroke suit in Arrow’s 100th episode—but it seems like things have been patched up. Unless, of course, this is all part of his plan to get closer to Stephen Amell so he can finally get his revenge and put an arrow in his eye. This news comes not long after The CW announced that Katie Cassidy would also be returning to the show after her character was killed off last season, but she’s playing an evil version of her original character who comes from an alternate universe. As far as we know, Bennett will be playing the same old Slade Wilson, who has been trapped in a prison cell on a deserted island for about three years. Also, it might be worth noting that there’s now some question over whether or not Joe Manganiello will still be playing a big-screen version of Deathstroke in The Batman. If Arrow is using the character again, it might be an indication that the movies have decided to go in a different direction. We don’t know when Bennett will return to Arrow, but if Amell is just now tweeting about it, there’s a chance it won’t be until very late in this season.